This stage starts with selecting an image to be translated into a woven design. 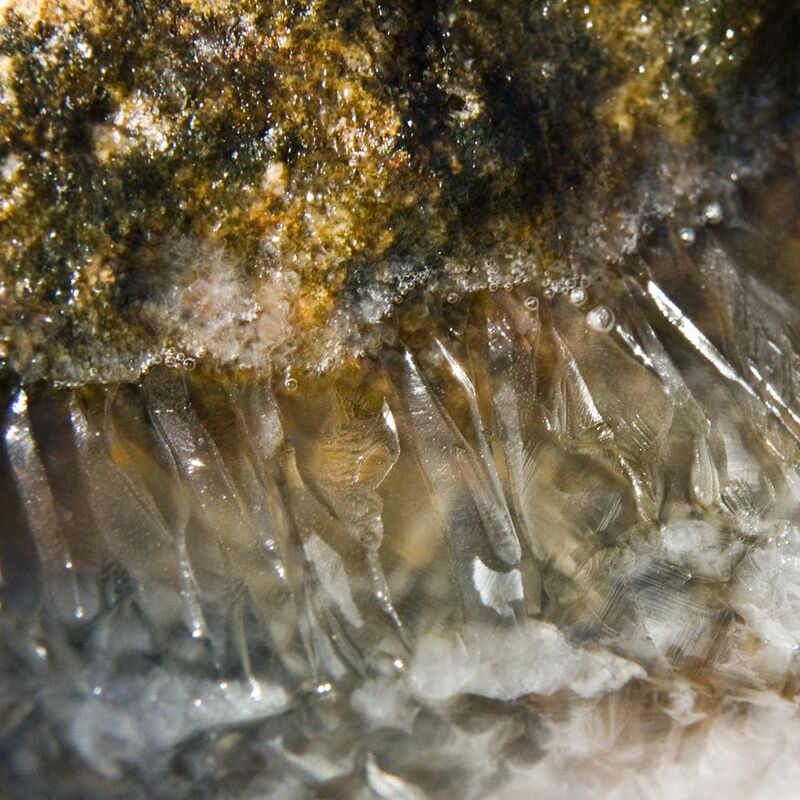 I chose this close up of the crystallized structure on some rocks at Osprey Bay near where I live. I chose this image because of the wonderful colours, the contrast between matt and metallic and the contrasting textures between the rougher rock and the crystal shards. I prepared a woven colour card as per the guidance notes. 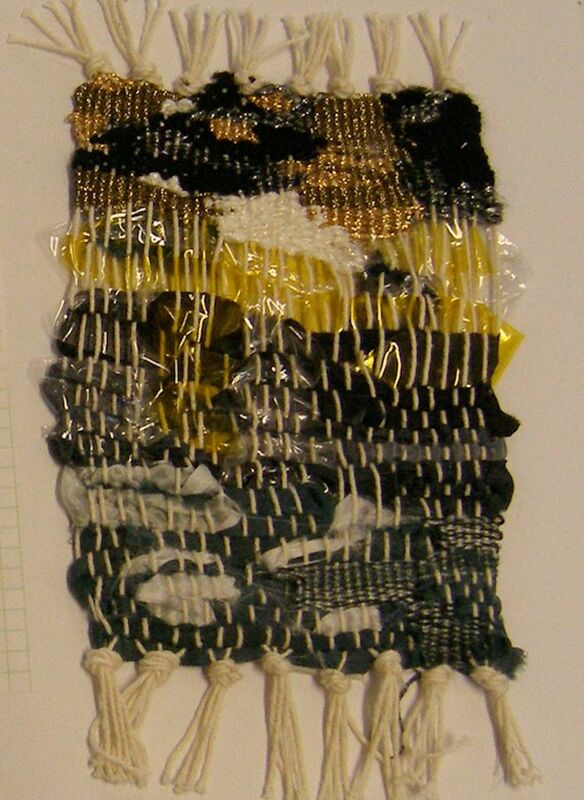 This included knitting yarn, embroidery thread, metallic thread, torn silk fabric and cut strips of cellophane. 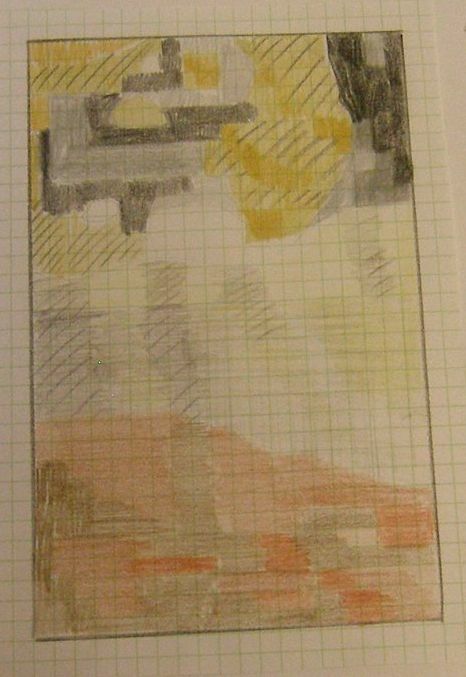 The next stage was to translate the image onto graph paper and shade in each colour. 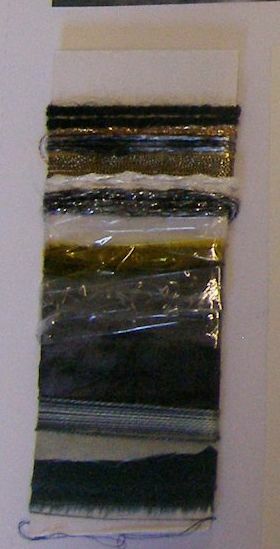 The colours do not match the woven sample and are a guide only. Finally I created the woven sample. The weaving process was more difficult with the varying thicknesses of the materials. I also found it difficult with the thicker materials to match some of the smaller areas in the original design so I ended up simplifying the design as I worked the sample. The clear cellophane was effective for the glassy crystals but the yellow was too brash and needed to be toned down. The top section with the mixed black and gold works well when compared to the original image as it captures the colours and the textures. This section was easier to work as the threads were similar in size (although some I worked doubled and still took multiple rows to match one row of the black knitting yarn). With the thicker materials the warp shows strongly, and if I was to work another piece I would consider painting the warp yarns first in toning colours so they are not so intrusive.